Baby monitors have been reassuring parents for some time now but choosing the right one can be quite overwhelming due to the sheer number of products available on the market today. It’s especially complicated for first-time parents who aren’t aware what to look for in terms of features, but if you are looking for a device that is modern, simple, safe and effective then i know just the one for you. 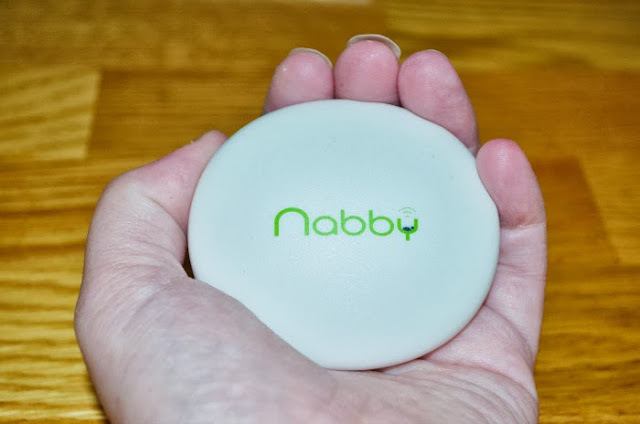 Introducing Nabby, a brand new and innovative baby monitor which has been specifically designed to work with smartphones and is compatible with iphone, ipads, tablets and android phones. When we were given the opportunity to be one of the first in the UK to test the new monitor, we had no hesitations in saying yes and have been putting it to the test for the last couple of weeks. 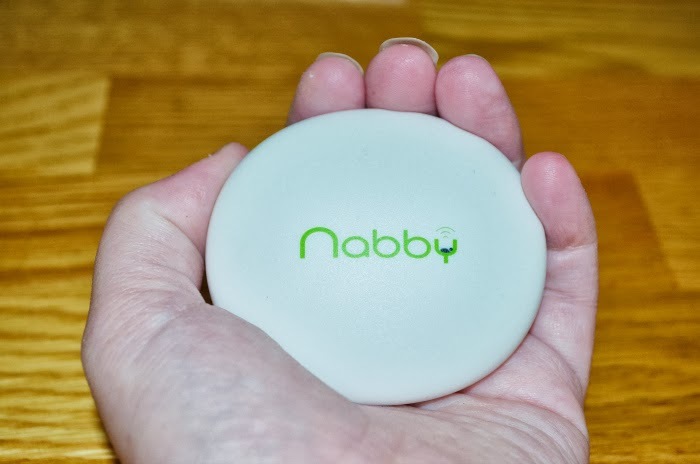 The Nabby monitor comes presented in a small white magnetic box with all the information you need written on the rear. There is no need for a manual as the monitor is so easy to use and set up but there are picture instructions available on a little card inside of the box should you need them. The box is split up in to 3 compartments with the monitor in one, the USB charger in another and a handy wrist strap in the final one. If you’re anything like me, when you first open the box you’ll be surprised by just how tiny and lightweight the monitor is – it literally fits in the palm of your hand and can be easily carried around in your pocket or using the wrist strap provided. They say good things come in small packages and they couldn’t be more right. Nabby’s connection is safe and unique as it pairs with your smartphone or tablet using a special long distance bluetooth connection.You don’t need to worry about unsightly power cables being in reach of little fingers or even loss of wi-fi signal/internet connection – everything is done wirelessly which is fantastic. 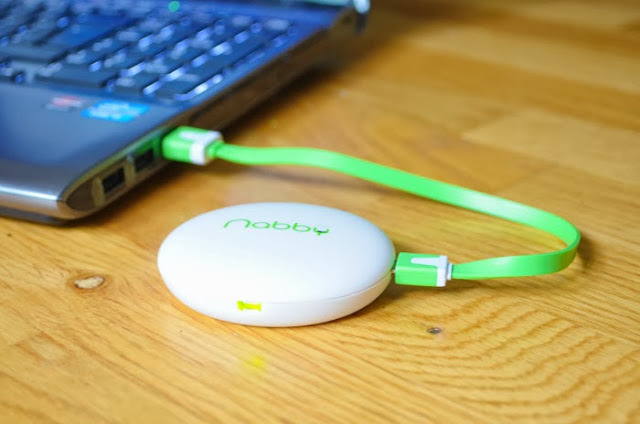 All you need to do is simply connect the Nabby monitor to your laptop or computer using the green USB cable provided, wait for the red light on the diode to turn green (indicating that your Nabby is fully charged and ready for action!) and then turn your bluetooth on to connect. Simple. *Sleep Timer, which shows how long your baby has slept and tracks all sleep periods. *Temperature Sensor, which displays the room temperature where your baby is sleeping and you can set an alarm to alert you if the temperature gets too high or drops too low. *Listen Now, which lets you stay close at all times by listening in on your baby’s breathing. These features can be purchased separately at a price of £4.99 or do the sensible thing and select the ‘all-in-one’ option for a bargain price of £0.69.  Overall, I think this product is absolutely amazing and i cannot recommend it highly enough, it ticks all the boxes in terms of design, functionality and practicality. Don’t be fooled by its size as it’s packed full of brilliant features. There is no signal interference, the sound is crystal clear, it charges in less than an hour and best of all can run in the background enabling you to use your phone or tablet as normal. Seriously, what’s not to like? I also love the fact that you can name the Nabby after your baby, it’s little personal touches like this that make a big difference to us parents. 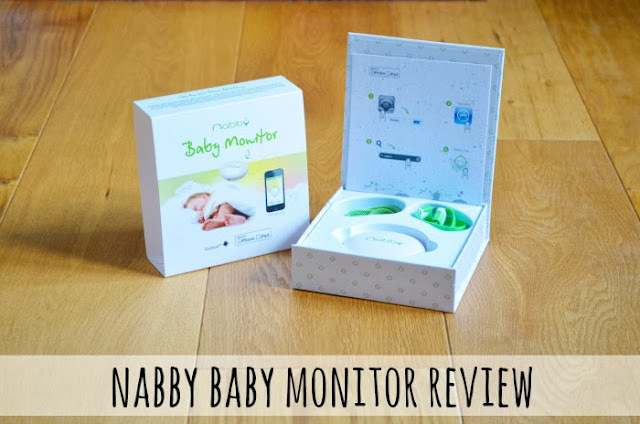 The Nabby Baby Monitor has an RRP of £119.95 (including free delivery) and is available to purchase directly from Nabby here.